On Friday I travelled up to Stevenage to capture the marriage of Simon and Trevor. This gorgeous venue is situated in the stevenage country side and is home to a giant old school barn, house and hotel! When I first saw these two dapper dressed men I could physically see poor Simon shaking with nerves but after the ceremony was over he was able to relax and enjoy the rest of his day. Trevor said that the ceremony was a complete blur and wasn’t without tears from both men and guests. It was so lovely to see the emotion flowing from everyone in the room. The weather stayed away from rain and the chill wind was fought off by the staff lighting heat lamps throughout the outside patio area. Everyone enjoy a scrumptious afternoon tea and after a break for guests to sit down and enjoy each others company Simon and Trevor returned to cut the cake and cement the marriage with the first dance. The first dance was so much more emotional than I thought it was going to be as it quickly turned into a passionate, deep felt hug whilst dancing so you can see that this moment they had been waiting for for a long time! A staggering amount of evening friends and relatives turned up in the evening and filled the barn with a hips shaking playlist from the DJ! All in all a amazing day but even more amazing for them! I’d like to thank Simon and Trevor along with the staff at ‘The farmhouse at Redcoats for looking after me so well and to once again congratulate them on tying the knot! Yesterday I was at Highfield Park to capture the marriage of Heather and Andrew. This beautiful venue had been decorated by Heather and Andrew’s deep red and champagne coloured flowers. It looked fantastic! Andrew was clearly showing signs of nerves moments before the ceremony, but he had nothing to worry about. When Heather walked into the ceremony room Andrew’s jaw could only drop as she looked amazing! The dress had a reminiscence of Kate Middleton’s with long lace sleeves and figure hugging frame. There was just the right amount of flair at the bottom with a perfectly lengthen train. After the ceremony we went off to some of the many locations that provided stunning photo opportunities for the ‘one on one’ and group photo’s. We had a surprise visit from their gorgeous dog ‘Jess’ who thoroughly enjoyed all the attention she was getting! 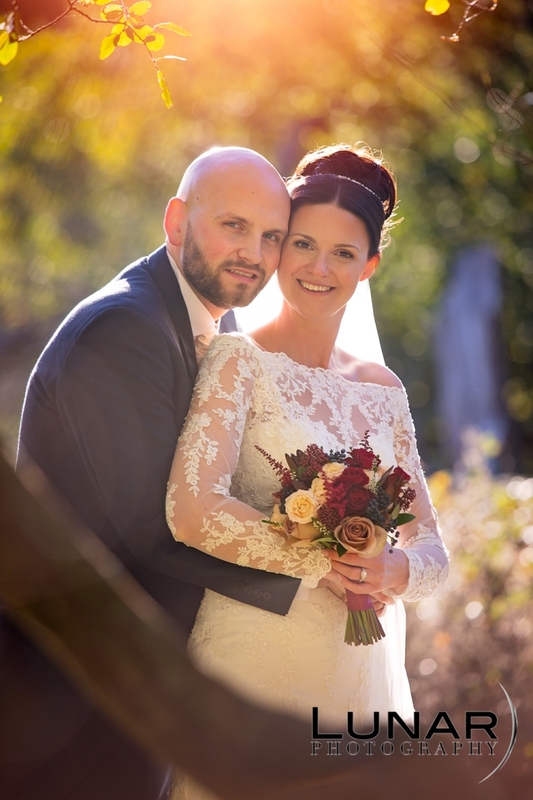 The autumn colours provided the perfect backdrop for the wedding and clearly, Heather’s attention to the colour scheme complimented this! There were more surprises with a Hampshire brewed keg of beer brought in specially for the wedding and was on tap for guests to help themselves. Oh and how could I forget the surprise firework display timed perfectly to AC DC’s ‘Thunderstruck’! It was a fantastic wedding from start to finish and it went out with a ‘bang’….. literally! Please raise a glass for the Mr & Mrs Yeates! Yesterday I witnessed the marriage of Rachel and Nathan in the centre of Milton Keynes. After a lovely and warm welcoming at their home for the bridal prep and cuddles with Bella (their pet dog) we moved onto The Church of Christ The Cornerstone in the city centre. This massive venue with it’s bright and airy multi-storey levels made for a great venue to get married in. What made this wedding even more unique was the fact that the ceremony was conducted by none other than Rachel’s father! This made for some amusing moments when he had to ask himself “who gives this woman away”?! Rachel had a very special and emotional message printed on a floor runner that went up the isle that I believe her Dad had no idea about. You could see the emotion as soon as he turned onto the isle and saw it. This was very touching! We were very blessed to have one of the bridesmaids singing with a live band drummed by one of the brothers and boy could this girl sing! I was so impressed!! With a large turn out of 100 people, Rachel and Nathan were whisked off in a long stretch limo to De Vere Horwood about 15mins drive into the country side. I’m a recommended supplier for this lovely house located smack bang in the country surrounded by fields and wildlife! I love this venue as it has so many good locations to wonder round for photo opportunities! We had a gorgeous sunset to finish up what was clearly a wonderful and emotional day for this lovely couple and super friendly family! I’d also like to extend a thank you for the staff of De Vere Horwood and to Lee the videographer for lending me his micro screwdriver kit to help fix one of my pieces of gear! That Dairy Milk was well deserved! I was thrilled yesterday to be asked to photograph Michelle and Matt’s wedding at the lovely Lain’s Barn in Wantage and what an adventure it was! Starting for the bridal prep at a nearby venue I quickly bonded with the bridal party enjoying a few laughs that only they shall know of! After a bit of a dash to the finish line getting the bride ready we made our way to Lain’s Barn, from there the emotion flowed like water. 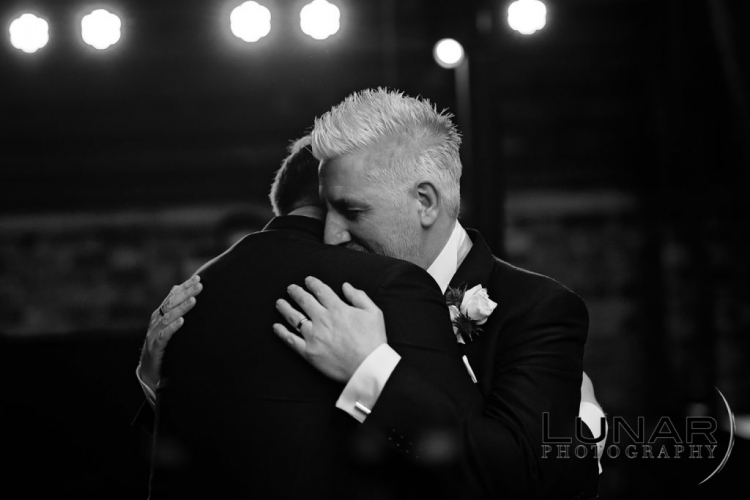 I love emotion, especially when it comes from the groom and Matt did not disappoint. As the ceremony began Matt became overwhelmed with tears of joy. Michelle entered at the back of the room and poor Matt just lost it. Two young girls had a reading half way through the ceremony, they too found the emotion of it all so much that they struggled to read it through the crying. I myself even had to fight it back, fortunately I could hide behind the camera! After the ceremony Michelle and Matt took a ride in the car, whilst they were away it became apparent that the bridesmaids car had a flat tire. Luckily I had a compressor to had so stood in the rain we managed to restore the cars tire enough to get it to a service station. Despite the on/off rain and drizzle throughout the day we still got a ton of gobsmacking photos that you’d find hard to believe were taken around bad weather. At the end of the meal ‘dad’ had organised a little surprise for Michelle & Matt, singing waiters! They really got the crowd going as they belted out one classic song after another, the whole room was waving their napkins! The rest of the day went so smoothly, the atmosphere was relaxed, the guests were all lovely (I even bumped into a couple of old friends) and this turned out to be one hell of a wedding, so many moments, so many treasured memories. They will all live on with Michelle and Matt, aided only by the photos. it was my honour to attend their service. Please congratulate note new Mr & Mrs Woodward! 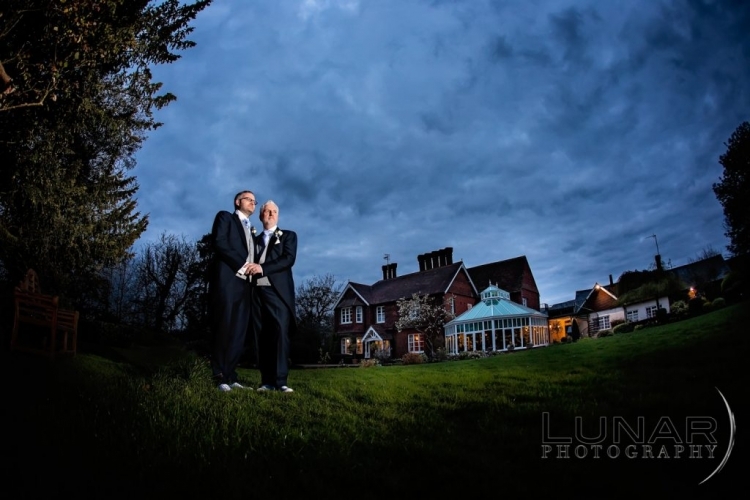 Last Saturday I was at ‘The Great House at Sonning’ where Luke & Amanda held their wedding at this beautiful venue. The ceremony was held in a beautifully decorated room which was packed with guests! After this Luke and Amanda took a short boat ride down the river viewing house’s such as Urie Gallagh and George Clooney’s house, not to mention the stunning views along the river all enjoyed with a bottle of champagne. After this guests were invited to take the same boat ride until everyone had taken a ride. The staff were extremely accommodating and friendly at the Great House at Sonning and I cannot thank them enough for helping me out. I’d also like to extend a special thanks to ‘Gary’ for helping me organise the group photo’s! After the meal the 2 best men gave us one of the funniest best men speeches I’ve had to date along wit ha great slide show and some video created by ‘Sky News’ especially for their wedding! AMAZING!! Luke and Amanda had also purchased my ‘post wedding breakfast slideshow’ so a big screen was set up after the meal which displayed the photos. Many compliments were handed to me on how quickly and amazing the photo’s had came out. Of course this is all down to Luke and Amanda and their guests! We finished up the night with some stunning closing shots back down by the river as the sun set! Please give a round of applause to the new Mr & Mrs Rustad!